Challenge: For student to create a working iPad stand for use in the classroom. Above: Design shown from above, note headphones holder. 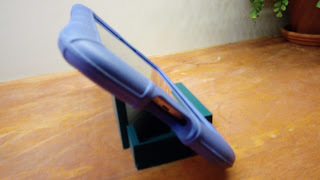 Background: Student was looking to design a stand for her iPad in the classroom, to allow it to be tilted and to have a storage space as part of the design for her headphones (button). Student was also wanting to personalise her work by including her name as part of the design. 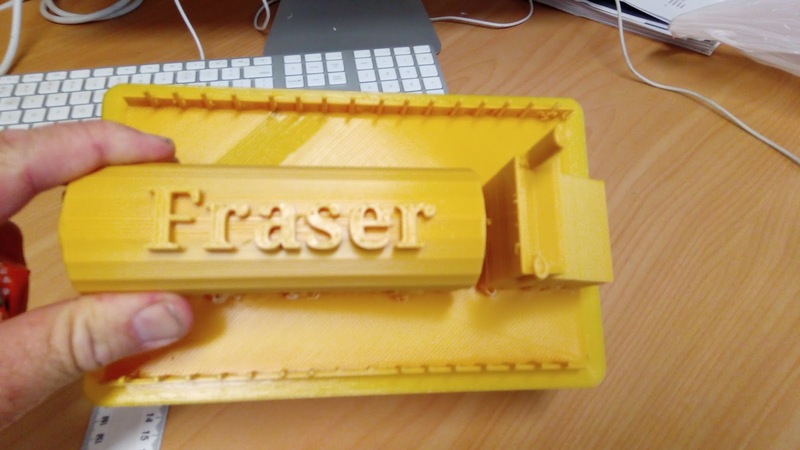 Student worked to design the holder for an iPad Mini. She is ten years old. Student used Tinkercad to create the main design features for this. She had previously been in the classroom where another student had produced first a delux iPad stand model and another student had created a more detailed design that was also featured as a post on this blog. This student was working independently and was less inclined to add additional features. 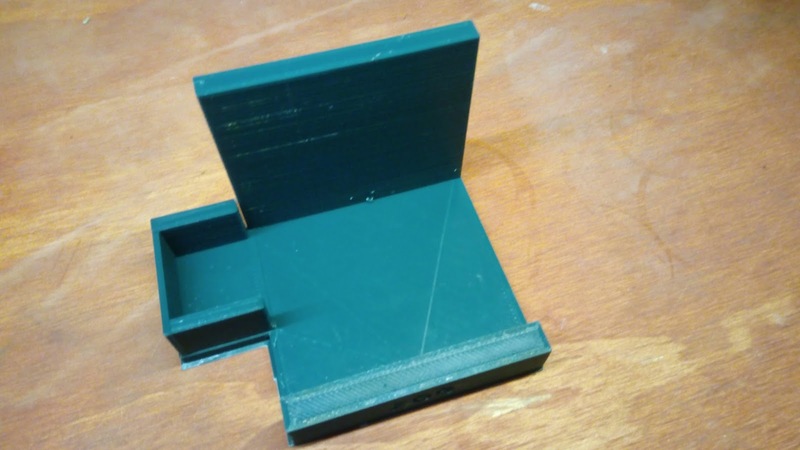 Level of Difficulty: Medium - this was a seriveable print that relied on particular angles specific to the Mini iPad. The student minimised the complexity of the base. Timeframe: Eight hours - this is considerably less than the delux versions that were produced last year. This is reflected in the relative deisgn simplicity. This would be considered probably the minmum dimesions for this design to work, and have enough weight to hold the iPad in place. Size: The main base for the print, the square was 100mm by 100mm. The battery part of the design was an additional rectangle 50mm by 40mm. The width of the print walls was universally 5mm. The bar at the front to hold the iPad in place was 20mm high, and a square of 10mm. The height of the design at the back, where the iPad rested was 90mm. What we would do differently: The student had a specific goal in mind which as detailed above was to produce a working iPad stand and this was completed. While there was little additional material added to the design (other than some of the delux models mentioned/blogged about previously). The student has stated that they are not intending to repeat the print/process. Next steps for students: More challenging projects to work outside of comfort zone to create unique and original project. This design has successfully completed the task. 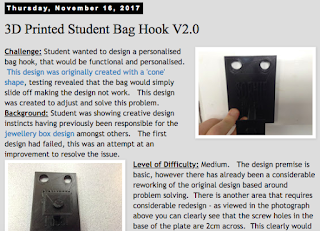 Challenge: For student to create an original, labelled hook, that could be used to hold an important key in the context of school activities, and for a student to create a labelled bag hook for themselves. the 3D Print. It would have to be drilled through, with an electric drill to ensure that the print could be secured to the wall to mount it. 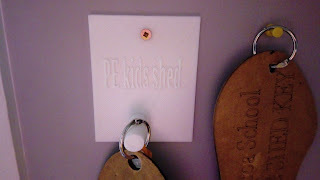 The students as a result took a series of test prints of the name hook, under adult supervision and started using an electric drill to drill through the print. They were looking for signs of damage or cracking on the student created work. 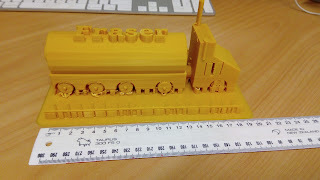 The drilled prints were either 5mm or 7mm thick, as the finished print was. 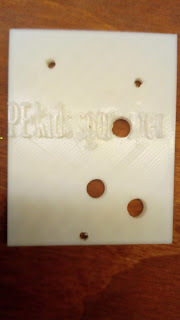 The students discovered that they could indeed successfully drill through the prints without their being any damage to the print itself, meaning the completed key holder could be secured to the wall. It was noted by the students that the point where the print appeared to be weakest was where the lettering was located (in this case where the lettering naming the key was held as shown left). Level of Difficulty: Medium-High given the variations that this print has had to go through. The design has gone through a number of variations and stages. The PLA is strong enough to have an electric drill screw right through it and still maintain its strength. Given that the intention is for a key to be held in place weight is not necessarily an issue (although this will be tested for the final design of the bag hook as potentially this could be an issue. Time frame: Six Hours. This was in essence a test to ensure that the PLA could withstand drilling and be mounted to a wall. Depending on the size of the label and the lettering required this could be considerably altered. 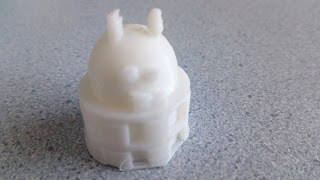 As is usual a 8mm nozzle was used on a regular print setting. Size: The final print for the wall was 5mm thick, 75mm across and 95mm high. This was perfectly suited for the purpose that was required. What we would do differently: Consideration was not given for the colour of the PLA relative to the background colour which it was going to be mounted on. The lettering on a white PLA background did not stand out given that it was mounted in an office, and consideration could have been made to having a different colour, or possibly glow-in-the-dark filament. One point that was careful for this mounting was to ensure that the print was safely mounted to the wall (and not drilled into the wall near the electrics) which is reflected in the single screw that is shown in the picture. Next steps for the students: There are additional prints that are intented in this design, following the process to have specific locations for high usage keys which students need to access from a set location (and also to ensure it is easily recognizable if a specific key is not there). There is an obvious opportunity for labelling for a bag or other item of importance in the classroom. Challenge: To produce an original designed container for student to store work material. Background: Student was inspired by other creations in this series to produce a desk organiser. 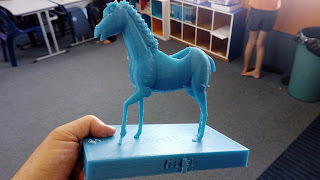 Student is nine years old and has already produced an impressive run of prints, including the horse glow-in-the-dark on a stand. She was challenged to personalise her design by adding something that could be identified as hers onto the print. She choose a 'Unicorn' motif that she was able to source from a third part and personalise her design. Print was produced completly by the student with no input from the classroom teacher. Student in fact managed to complete the design at home and brought the finished design to school, which was then run through the printer. Level of Difficulty - Low, which is a reflection of the work and the confidence that the student is starting to develop with the 3D Printers. The basic design comes from the Tinkercad main interface. The student thien shaped it as appropirate. The additon of the 'Unicorn' motif was a challenge, to be located correctly and was pulled out of the design, instead of being sunken in. Timeframe: Four hours. This is considerable shorter than other prints in the series, which are ranging from twelve to twenty hours. As a consequence this was more realistic print time for a group or class based project where a number of prints could be produced that work together. 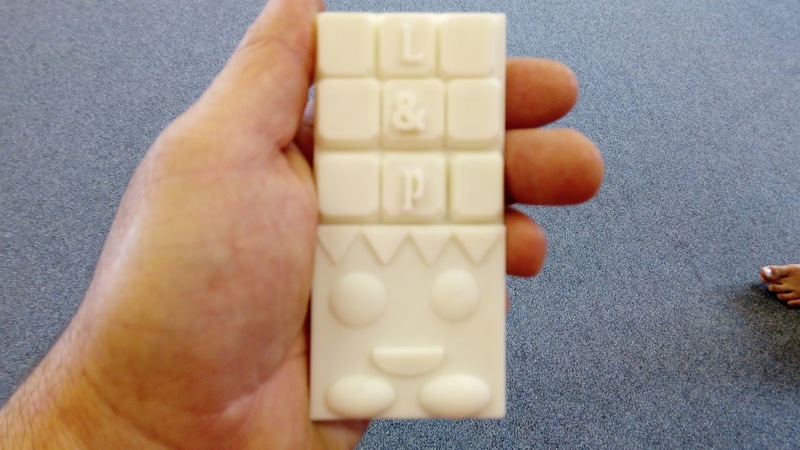 Size: As shown above - the design is 7cm across from side to side. The width of the design is 5mm across at all points. The height of the design is 8cm high. Given that this was intended to hold pens, pencils and other items of stationary, this would be close to the minimum shape required. What we would do differently: The student made a decision to not include their name in the design as the 'Unicorn' was intended as their personalisation. 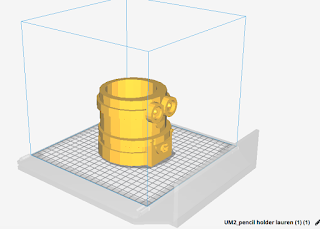 The student intends to produce a series of this containers using different PLA to produce a different range of designs, and different sizes to then group. Next steps for the student: This design has been more or less mastered and the student needs to move forward to challenge themselves in other ways on other projects. 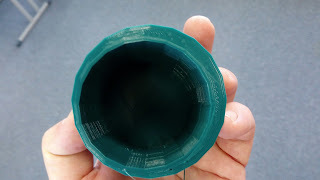 Print Notes: 8mm/Dark Green PLA/(Sun Brand). Created in Tinkercad. 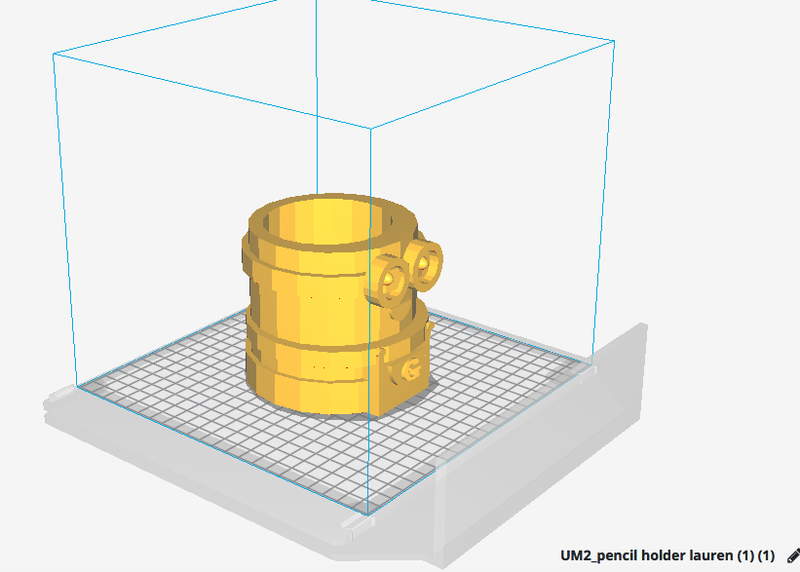 Printed UM2+. Challenge: Students are enouraged in the classroom to create an original 3D Printing design that has a purpose. Generally the projects are encouraged to be created without third part involvement. Background: Student has been involved in 3D Printing opportunities within the classroom setting for the past two years. She is a ten year old student who wanted to start a design. She had other students that had produced prints along this theme or design, such as the 'Minions' inspired desk organiser previoulsy featured on this blog. 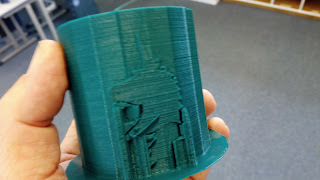 Student was able to produce this print on her own without input from the teacher. She ran through two draft prints which were shown to be undersized, although the design was what she wanted. The intention was to have an area for her pencils in one of the containers and pens in the other. She ensured that the depth of the containers would hold the pens and the weight of the container would allow it to be used in the classroom. Level of Difficulty: Medium. Student had to refine design to ensure that the size of it matched the purpose that she intended (hence the two draft prints that were re-designed). Student was able to print this independently. Timeframe: Fourteen hour print. The design had space to hold some stationary, the width of the holders was between 1.5cm and 5mm. The name plate at the back was a solid block. Size: The square base plate was a square that measured 11cm by 11cm. It had a depth of 1cm. The first holder, measured 65mm high and was 50mm across. It had a width of between 5mm and 7.5mm. The second holder had a height of 100mm and was 65mm across. It had a width of the walls of the design of 15mm. The name block was raised 135mm from the back of the design. The design measured 80mm across and was 30mm wide. The 'McKenna' lettering was raised 4mm from the top of the base of the shape. Given the dimensions of the design and the purpose of the shape this would probably be the minimum required for it to be successful. What we would do differently: When the design was originally created the student had not measured the dimensions of the design to her satisfaction. She could have mocked it up using paper or cardboard first to ensure that the size was what was requested. Next Steps for Students: This has successfully completed the brief for the student, and the print would not require any additional design. 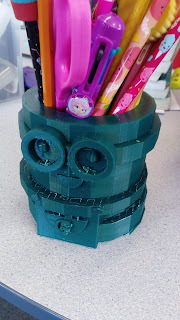 Challenge: For student to create thier first 3D Print to organise the stationary on their desk. Background: Student is a Y5 student (nine years old). She wanted to experiement with two different prints, one being a money box (which is being redesigned) and this one. It was themed after the 'minions' characters. This was an original design. 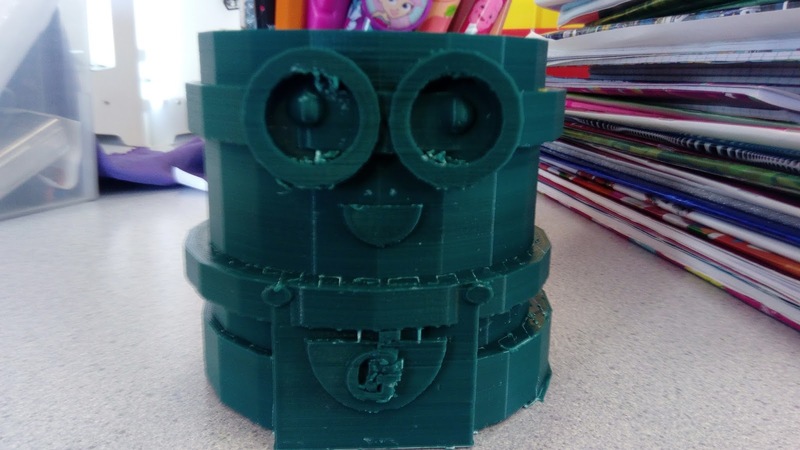 The shape of the minion was created from the tinkercad main template, as you can see from the photograph, it was created using a variety of simple shapes. 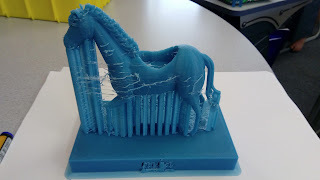 This student also had a sibling who has printed and designed projects in the past using Tinkercad and they apparently provided some assistance in the composition and the balance. Level of Difficulty: Medium this was more complex that it would perhaps appear. The student concerned had created this design form scratch and featured a number of shapes that needed to be created in relation to each other and size. Timeframe: Sixteen hours. The print was relatively thick in places, this meant the print itself was very robust. It made it ideally suited for its purpose, it had weight to it, was capable of storing a significant amount of student stationary. While the print time could have been reduced in time it would have reduced its effectiveness. Size: 11cm across (length) and 10cm in height. 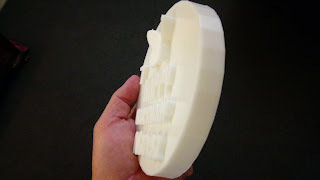 The thickness of the print, for the main part of the design varied slightly between 15mm and 10mm. The base of the design was 2cm thick. 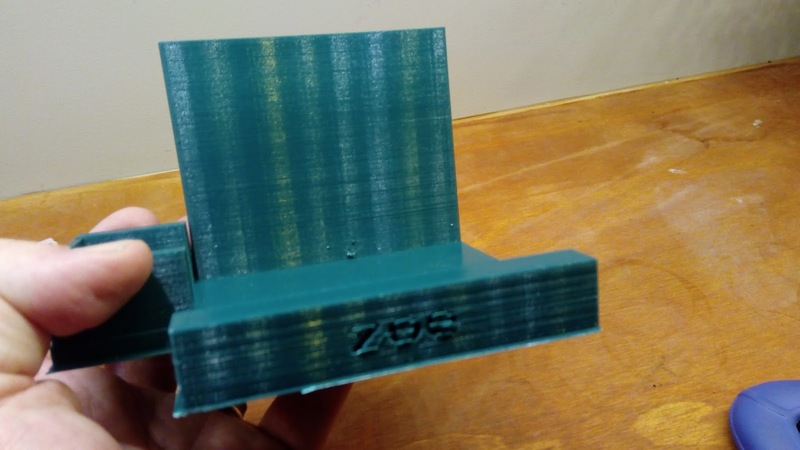 What we would do differently: This is one of the prints that work exceedingly well, and the student was thrilled with the result, it served its purpose successfully and we wouldnt consider altering it or requiring it to be printed again. Next steps for students: The student needs to move onto other projects, the only possibile addition to this print would be some form of lettering, naming or message which this print did not contain. Challenge: Student with autism is in a classroom where the students rotate desks on a regular basis when we change groups for different curriculum areas. We wanted to personalise and make something for the student to reflect this. Background: We were looking initially at simply a marker for the student, however it became apparent that we could move the marker and the student would know where his desk was and where he needed to be. The print was not intended to function this way, but became a by-product of the success of its use. The student had a particular fascination with trucks and anything related to trucks. He was able to produce this print with assistance. A basic shape was located on Tinkercad, that he approved of. The print was selected on the basis that we wanted to make a significant addition of his name as a major feature. A decision was made to mount it on the back of the tanker part of the truck, as shown above. Level of Difficulty: Low. Essentially this is a print that was created by a third party and was publicly available, the addition of the input from the student was limited. The student was able to have limited input into the print design, which is a reflection of the level of autism of the student. Timeframe: Thirteen hours, with a 8mm nozzle. 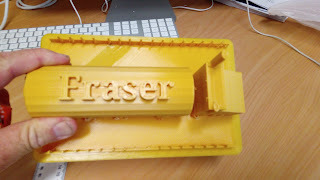 The print base was extremely thin and flat (1mm) however this appears to be robust enough with the handling of the print, and the purpose of print was for it to remain static, which is being currently moved by the teacher to mark where the student needs to move his gear and start to get to work at. Size: The length of the print, from side to side was 22cm with a 12cm height. The width of the base was 1mm, the truck itself measured 20cm in length, 8cm in height and was ten centimetres across. 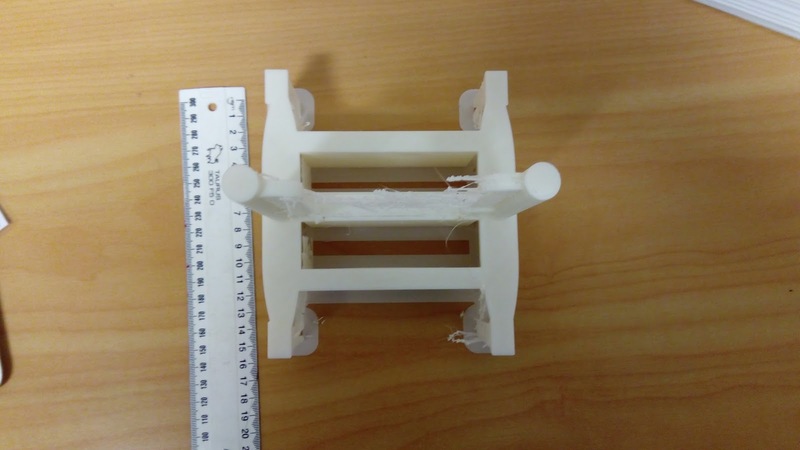 What we would do differently: The student has already broken two pieces of the print in the first several days. One of the horn on the front of the cab was snapped in excitement and the fence on the front of the truck. The idea was to have a space between the truck and the fence where the student could put tools to help him with his work. The fence could have been more robust, as over time we will be monitoring the level of damage that is done to the fence, by the student breaking it. Next step for the students: The student concerned will not be repeating this print, unless another student works with him to replace aspects of the fence (or redesign it). We have also considered that this process and product could be used to have students report to a particular group, such as occurs in the junior school as the markers could be coloured depending on the filament used. Challenge: Student wanted to design their second individual print and wanted to feature horses with the design. Student is a Y5 student, nine years old, designing for the first week of school. Background: The student found a horse based design, and individualised it by placing a plate on the base of the horse, which their name was sunk into. To ensure that it could be actually used for storage the location of the saddle/back of the horse had a cylinder shape dropped down into it. A decision was made to print the horse with Glow-in-the-dark filament as we were experimenting with using it again (previously we'd run some seasonal themed prints but these had proved to be of limited success - see below and previous prints). 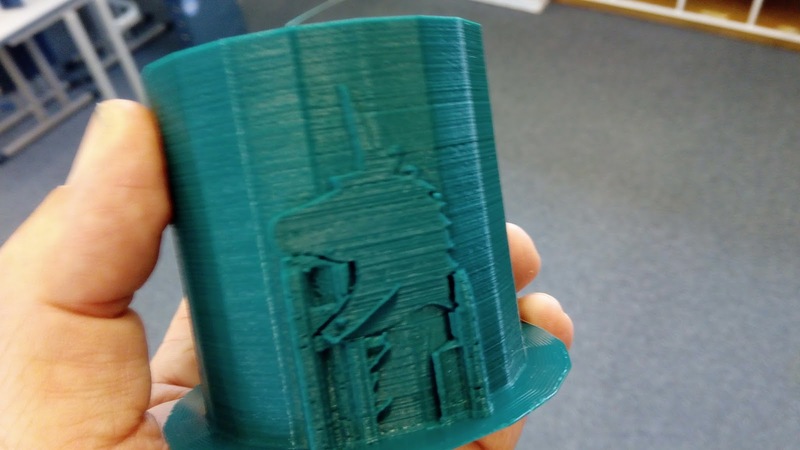 The student created a complicated large print, however as it was the first time a print of this type had been attempted the student was encouraged to go for it and complete the process and printing. Level of Difficulty: Medium. The horse was sourced from a 3D printed site, the base was designed from scratch by the student, who had been shown how to drop her name into a design. She also had worked out how to drop a cyclinder shape into her design to hollow it out. Timeframe: This was a twenty hour print. It could have had a reduced time had the base plate been halved in size. Size: The dimensions of this print were significant. The base measured 25 centimetres across, the height of the head of the horse was 20cm from the base. The base was 1cm thick and as noted this could have been reduced in alter the print time. What we would do differently: Glow-in-the-dark filament was used primarily because it was the last spool before more material arrives. This has proven problematic in the past, as we didn't have it stored in air tight containers once the spool was started. We had residual filament on the print which was removed however we are intending to tidy up the print once we have the ability to do so. The student did not create the horse design obviously and usually these designs we do not print, however they had modified it for a purpose which may encourage other students working on along a similar line. It conceivably could have been printed to a smaller scale. Rafting removal (which was done by the teacher fearful of the legs breaking, which did not occur) saw the tail break. This was kept by the teacher and will be super glued back into place once the print has been cleaned. Next Step for Student: None given all the circumstances, this was an extremely impressive first print for a student. Please note: The filament used for this print was Glow-In-The-Dark. As a consequence we raised the print temperature by the recommended 15 degrees to ensure that it was completed successfully. This appeared to makea significant difference to the success of the print. 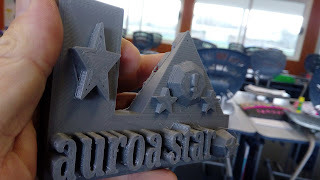 Challenge: Student was new to the classroom and wanted to create a 3D Print for the first time. He wanted it to be something that he could take ownership of (and produce himself). Background: Previous we have used a basic block to form the basis of the base of the lettering for a badge/name plate. This student instead used a 'wheel' as a base from the interface. This worked better than previous prints as it reduced the amount of filament required, however the lettering still had enough of a base to hold the lettering in place. It also had another benefit, once the wheel was produced the matter of producing a way to hang the badge without the need for drilling. As it clearly showed in the photogrpah the gap between the wheel spokes allowed space for it to be hung. Level of Difficulty: Low - student was able to produce this design the first time with minimal guidence from other students. 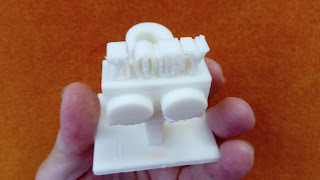 The print depended on a basic design from the Tinkercad interface with the added feature of the lettering of his name. Timeframe: Two hours forty minutes with a 8mm nozzle. As mentioned this is considerable shorter than previous prints in this series/design on the basis that the student went with a more interesting design instead of a standard block. Size: A height of 5cm high, 5mm thick (which allowed the print to be particularly robust) and a length of 9cm. This obviously was flexible depending on the size. The print was an introduction to 3D Printing and therefore the size was (relatively) limited. What we would do differently: This was a set up from previous badges/name plates as for the first time the students changed the backing plate from a simple block to a different shape from the main Tinkercad interface, given this circumstance and the sequence of the print (being the students first) there is nothing that would be significantly changed. Next Step for the Students: Student could target a specific location to produce a sign for, and make a sign or badge for a specific purpose. Given that it could be suitable for an out door setting. Left: Introductory print - approximate time - forty minutes. Student was experimenting with using a 3D Printer for the first time, and the design was straightforward. This print measured only three cenitmetres across, reflected in its print time. Left: Basic name badge- wheel design. 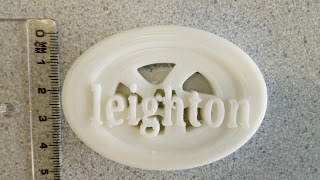 Student crreated a badge featuring their name, using the Tinkercad Interface template. Student then personalised it by adding the name. The wheel base allowed the potential for this to be hung or pinned. Print time- approx. two hours. Size as shown in the photograph. 9cm across. Left: A shopkins inspired original created print. Student used the Tinkercad template interface to create the 'chocolate block effect. Student used the same template to create the face image on the bottom of the design, and intends to spray paint the design further. Left: Personalised student desk tidy prototype. Student was looking at creating an original design to store their stationary, personalised with their name. The final design is going to be approx four times the size of the shown design. Print time - four hours (prototype) final product is expected to be in the twelve to sixteen hour range and size of print will reflect this. 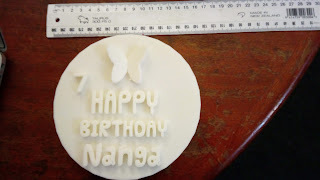 Challenge: Student wanted to personalise a gift for a family member for their birthday. Background: Ten year old student was able to independently produce this print from scratch, including all details and scaling (correctly). Student presented the finished print to the classroom teacher who printed it. There was no input what-so-ever from the classroom teacher. Level of Difficulty: Medium the print consisted of a main base with additional lettering, the number seven and the butterfly that was added to it for depth and details. The student had a particular design in mind and was focussed on this size. Timeframe: Twelve house - this was primarily the depth of the base, which was one and a half centimetres in depth. This could potentially have been altered reduced. Size: From end to end the design measured 15cm across. As mentioned it had a depth of 1.5 cm for the main base. The lettering and other features were raised 5mm from the base. What we would do differrently: Nothing - the student was able to execute the entire project from start to finish with no input from the teacher, just about perfect. Next step for the students: The print was straightforward and the student as repeatedly mentioned took ownership of the entire project. The student could challenge themselves with using more variation with this kind of design, looking to include perhaps some inter-locking parts or parts that work in combination with others. Challenge: Student wanted to design and create a desk reward. Student had been at a school where the teacher had a 'badge' which moved from desk to desk to to show the best working student of the week. 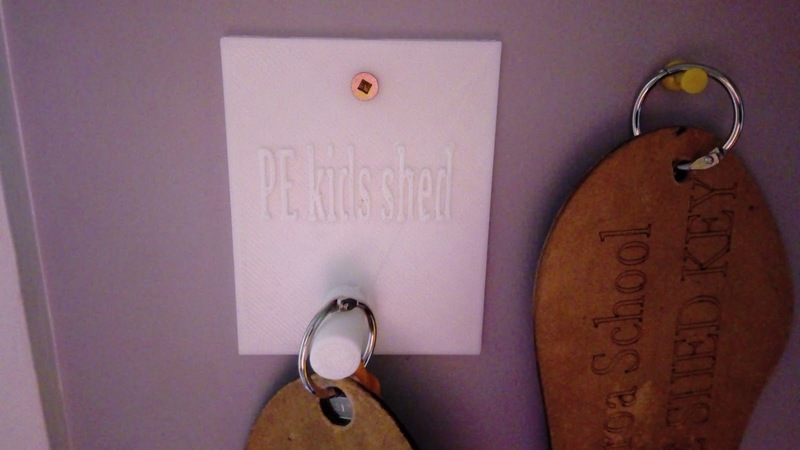 Student wanted to continue this idea, but instead of using a pre-bought cup or medal however wanted to create a personalised 'badge' for the student to have sitting on their desk. Background: Student was inspired to combine ideas that he had seen in the classroom, with an idea that had brought from his previous school, but put the spin of producing something original using a 3D Printer. The student (who was ten year old) was designing essentially for the first time using the 3D Printer, however they had spent time working on joint projects with other members of the classroom who assisted with the design and the addition of features. Level of Difficulty: Medium. The design has a number of additional features placed onto the top of the badge, as shown in the photograph - the point of the triangle was angled. Timeframe: Ten hours - there are various additions and changes that could be made to the design to make it more workable (see details below). There could have been some small changes to be made but given the dimensions of the design the print time would not have been significantly altered. Size: The base of the design was 12cm across. The main height of the design was 8cm. The depth of the badge (width) 1.5cm. 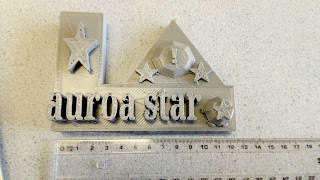 The 'auroa star' font was raised 1cm from the base of the design. What would we do differently: The badge should have been designed with feet or a means of making itself free standing. 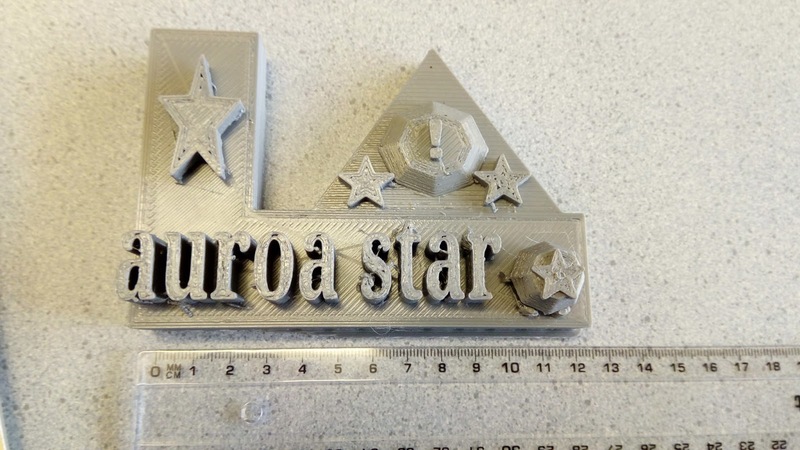 The student assumed that the base of the badge would have been enough for it to have stability, however the weight of the base of the design caused it to tip, when it was supported to stand, the 'auroa star' part of the design needed to be raised from the base to ensure that it was the dominant feature. The addition of the stars on the top of the badge - could have been more refined, as in a sense the design was to fit as many stars onto it as possible. Next steps for the students: The student had a positive idea here, however the practicality of the design should have been reserached, in particular the base of the design. There was a potential here for a movable sign that could be placed on the students desks - perhaps a 'do not disturb sign' or a 'assistance' sign (for student to gain the teachers assistance with completing a task). Challenge: For student to create a working model of a boat that floats and is able to have a small motorised unit attached to it. Background: The students from our classroom (and school) from New Zealand have returned to school and are completing projects that were designed and put together at the end of the 2018 School year. Previous versions of this print run had been designed to include masts, in the first version, detailed on this blog here. The second version involved the removal of the masts of the ship, to spend time focussing on the balance and hull. 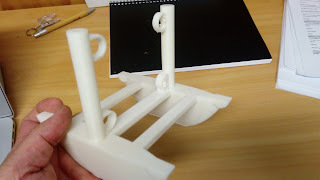 In the first version there was a middle platform which provided stability, but the student concerned wanted to create a realistic catamaran as possible, hence experimenting wtih removing it. Level of Difficulty: High - this is an incresing complex print with a number of factors that are increasing difficult to balance. The student himself would be one of the most technically gofted design students who consistently shows excellent problem solving and adapting of his designs. Timeframe: This print took twelve hours and the design required significant rafting. This should not be considered to be additional to the shape and would need to be required to remain with versions of the print. Size: The hulls shown in the inserted photographs were 15cm long, had a width of 2cm at their largest and were 5cm from bottom to top. The strengthening cross beams were 10cm acoss. The masts shown were 9cm high. What would we do differently: This version of the boat was not as successful in terms of how robust, and the balance that it has. In the previous versions of the print the masts were thinner and the base of the design was balanced by the base. When tested in water, in the school swimming pool, the boat tended to flip easily and was clearly top heavy. The student has recognised this fault of the design, and already completed testing with this print and as a result has redesigned it, thinking about balance, and started to look at the design of the Americas Cup Boat.